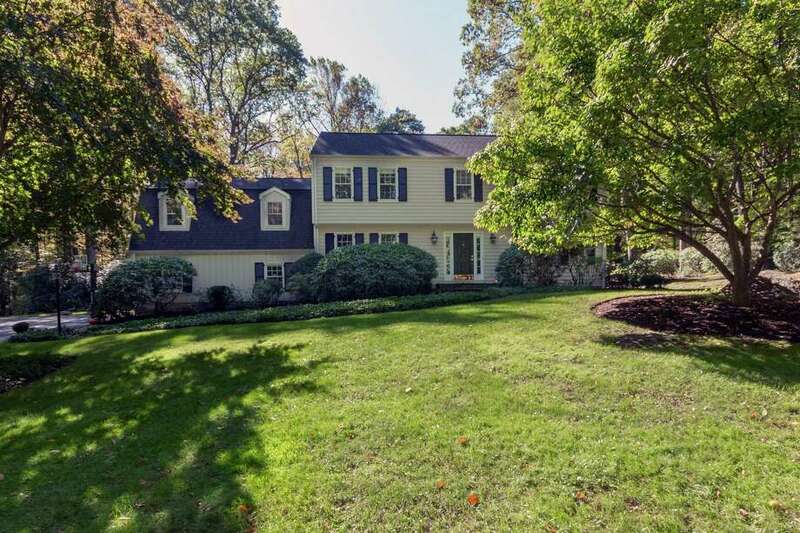 The Garrison colonial at 85 Kellogg Drive sits on a secluded parcel of nearly two acres down a long, tree-lined driveway. WILTON — It was a picturesque autumn weekend in 2007 when a young couple from out of state went house hunting, driving down country roads in rural parts of Wilton and Ridgefield looking for a new place to call home. They didn’t find their new home that day. It wasn’t until the following spring that they came upon the property they eventually purchased, and when they did find the place it wasn’t just the Garrison colonial at 85 Kellogg Drive that caught their eye. It was the entire property of nearly 2 acres that was so alluring, with its woodland privacy screen and a colorful array of rhododendrons and azaleas and myriad perennial shrubbery and flowers. The 3,275-square-foot, cream-colored house with black shutters sits in a secluded setting well back from the road on a private tree-lined drive. “It’s like your own little oasis,” one of the owners said. “We loved the fact that it was away from the road. You don’t have to worry about the kids playing outside,” she said. The children like to ride their bikes down the driveway, which is so long that parents have no worries of them nearing the street and risking a collision with vehicles. As winter approaches with the promise of snow, she said children can safely sled right in the front yard and down the driveway. The adults enjoy the great outdoors as well. “We love being outside as much as we can and this house allows that. We are on the screened porch on the first day of spring through Thanksgiving,” she said. In the quiet backyard there is a fire pit and a little stream. Beyond their front and back yards there are opportunities for hiking and birdwatching in municipal spaces. This property is within walking distance to Kellogg Drive Open Space, Vista Road Open Space, Quarry Head Park, and Linden Tree Road Open Space, the latter of which straddles Connecticut and New York. Quarry Head is just a quarter of a mile away. Clapboard envelops the main house, while one side of the attached two-car garage features a board and batten exterior. A patterned red brick path leads from the driveway to the front door. Another such path leads into the backyard and to the wood deck. This house was built in 1974 and was upgraded and maintained over the years. It recently received a new roof and gutters. It was completely painted inside and out. The new family room includes new hardwood floors and built-ins. The kitchen was given new appliances including a new gas line to fuel the range. The master and hall bathrooms are new and the first-floor powder room was updated. From the foyer, there is a large formal living room with a red brick fireplace and chair railing to the right, and the formal dining room with chair railing to the left. Both rooms have dentil crown molding. The same molding is repeated in the living room fireplace mantel. The eat-in kitchen boasts granite counters, white ceramic tile backsplash, and high-end stainless appliances. The eat-in area has sliding doors to the three-season screened porch and adjoining deck. Accessed from the kitchen is a set of stairs to the spacious family room above the garage. It has a floor-to-ceiling stone fireplace and custom built-in media cabinetry. On the second floor, there is a generously sized master suite including a ceiling fan, walk in closet and the new marble bath, and three other bedrooms. The fully finished basement provides ample additional space for media or recreation activities. The location of this house was also a major draw. “We’ve got the best of both worlds,” one of the owners said. It is equidistant from the centers of Wilton and Ridgefield, both are only about seven minutes away. For information or to make an appointment to see the house, contact Katie Nugent of Berkshire Hathaway HomeServices New England Properties at 917-374-1581 or KatieNugent@bhhsne.com.